Northshore squadron pilots have access to two nearby CAP aircraft. N649CP (based at Boeing Field) and N313CP (Paine Field) are late-model G1000-equipped Cessna 182s. 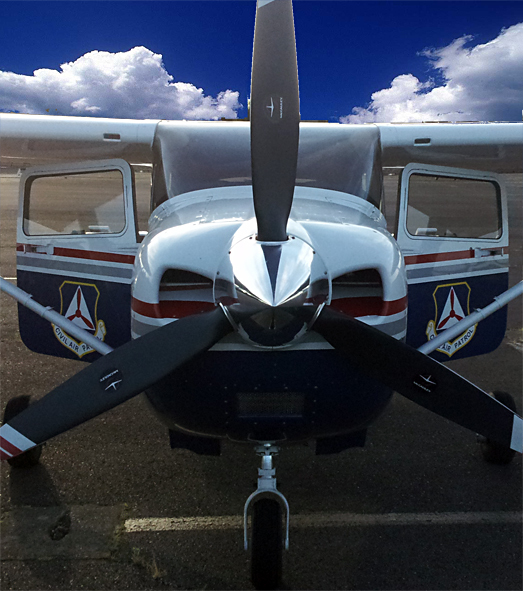 Flying with the CAP is an excellent way to use your pilots license to support your community. In order to pilot a CAP aircraft, you must be a CAP member with an FAA Private Pilots certificate, a current medical and current BFR. You must also pass a CAP flight evaluation, which includes written and oral quizzes and a flight test. CAP pilots having at least 175 hours PIC are eligible to fly transport missions. Those with at least 200 hours PIC may train to become SAR (search-and-rescue) Mission Pilots. And those with 500 or more hours can train to become glider tow pilots. Working Toward Your Pilots License? Although CAP may not provide initial training toward your license (we can help with subsequent training), it provides an encouraging, supportive environment to keep you going. Need to find a good doctor for your Airmans Medical? Interested in ways to save money on your flight training? Want to split costs, fly with one of our pilots, and get a hands-on introduction to our aircraft? Have questions about flying? We can help with all of that, and much more. If you are interested in joining us, come visit our squadron any Tuesday night and chat with us.